In the spirit of this year’s Chicago Artists Month theme, “Art Block by Block”, “Off The Streets” will feature artists who add their flare to the personality of Wicker Park by living and working in the neighborhood. These locals were found by word of mouth alone and chosen for their distinction among the masses of under-represented artists in the neighborhood. Six talented individuals will represent the current artistic vibe of the neighborhood once so well known as an art studio village. One of these artists, Laura Lee Junge, began painting in a neighborhood attic studio during Wicker Park’s development into an art haven. Junge returns this earlier body of work to hang in the gallery she now co-owns, with the work of artists currently making Wicker Park their home and inspiration. One often hears the mantra of the starving artist struggling to get by, and indeed these artists have worked, and continue to work, to feed their passion for art. “Their hard work and struggle endears them to our community and gives them a place in the development of a neighborhood vibe,” says Anna Vlaminck, curator of the exhibit. “They may have helped you to pick out new furnishing for your home or to find an outfit to impress your date, or even made you a drink at your favorite haunt, but it’s their plight to find a niche in the art world that makes you remember them. It’s the hidden talent and voice of an artist that adds the intrigue to the seemingly ordinary in Wicker Park.” “Off The Streets” celebrates the success of the working neighborhood artist and provides the opportunity to see the rewards of their hard work. This special group exhibit displays a history of Wicker Park artists, both past and present, and their influence in defining the neighborhood. Themes touch on the psychological and satirical, street art, and abstraction in a variety of media. The exhibit runs from October 1st through October 28th 2012. An opening reception with the artists is scheduled for the evening of Friday, October 12th from 6-9pm. Reception and exhibit are free to the public. 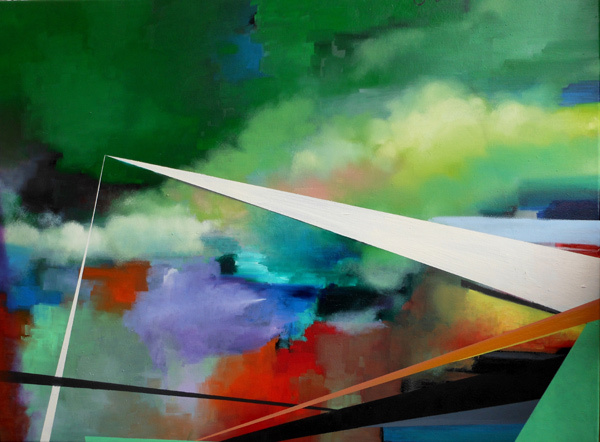 “Skyhouse 2”, COVE (oil on canvas, 30” x 40”) – A bold white line tears through a landscape of brilliant color. This painting’s style is developed from the artist’s beginning in graffiti. “2”, Erin Waser (oil on Panel, 32” x 32”) – Using round painted pixels in a large color range as a vehicle of manipulation, the artist explores how individual pixels interact to create a painting. The multiple layers within each piece create a relationship between the surface and background, where objects at once form and disintegrate. 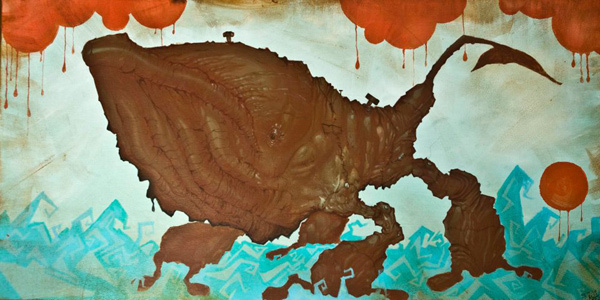 “Darwin Mach IV”, Ennis Martin (acrylic on canvas, 18” x 36”)– A Darwinian whale-like creature takes form in this colorful and inventive painting. 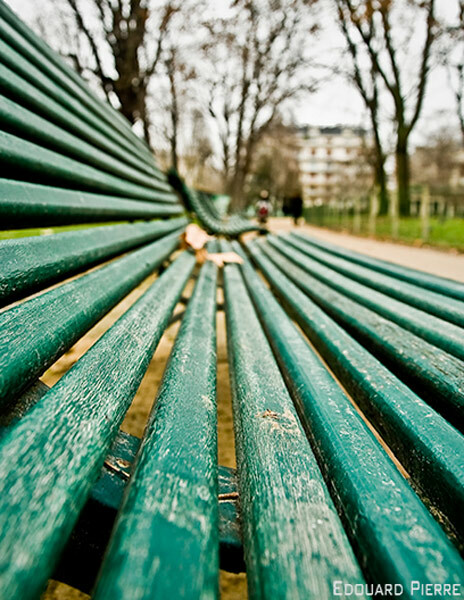 “Le Banc Parisien”, Edouard Pierre (photograph, 13” x 19”) – This photograph of a Parisian park bench is taken from a perspective that nearly abstracts the image. The lines created from the green slats that make up the bench lead the eye to directly to the background which is frame by the edge of the bench itself. “Gilbert Herman the 2nd, King of Insanity”, Laura Lee Junge (oil on canvas, 52” x 46”) – This painting, a portrait of the artist’s father, is the foundation of her painting style and delves into the psychological and surreal. A king-like figure, composed of elements that are both a part of himself and the perceptions of those around him, sits in a swirling and unstable environment. The physical manifestation of the voices in his head and personality specific objects emerge and disappear in the strokes that define the king. 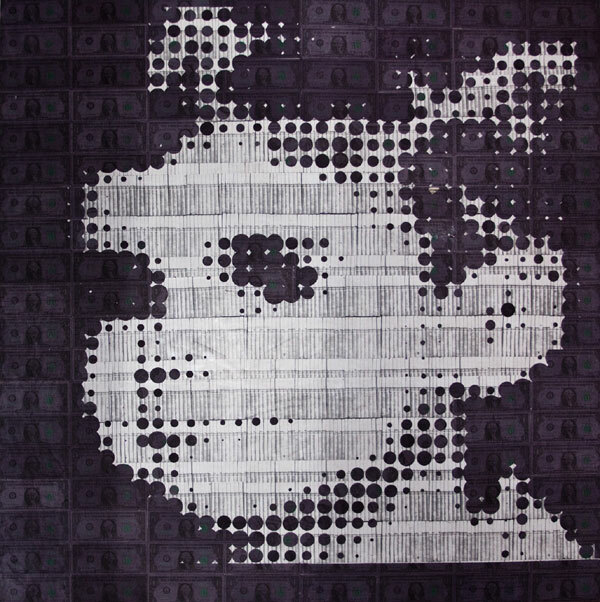 “Inheritance”, Joseph Knox (mixed media, 48” x 48”) – This mixed media piece layers a dark background with a light foreground in which one distinguishes the face of a young boy. Upon closer inspection the dark background is revealed to be a pattern made of money and the light face is composed of a pattern of cigarettes. The artist shows, when we are young, the lessons of financial responsibility and earning a wage seem positive, but they can in fact be correlated to what we learn about cigarettes. When money becomes the sole pursuit of a person and isolates them from everyone it can indeed be addictive and dangerous. “Off The Streets” is part of Chicago Artists Month 2012, the seventeenth annual celebration of Chicago’s vibrant visual art community presented by the Chicago Department of Cultural Affairs and Special Events. For more information, visit www.chicagoartistsmonth.org. 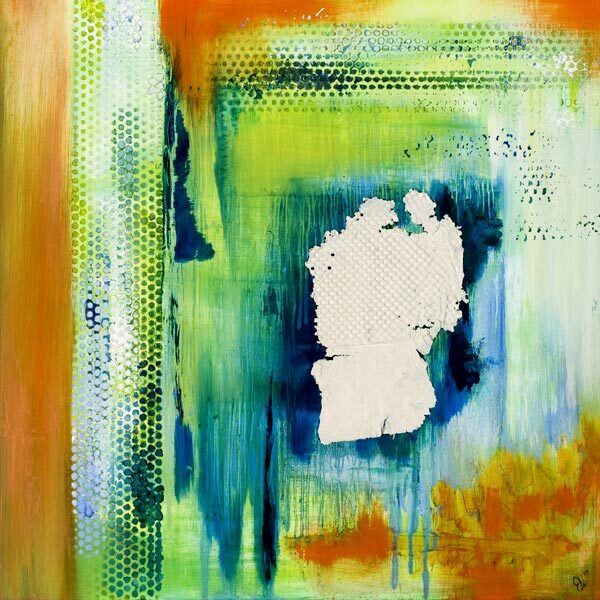 The Jackson Junge Gallery features the work of Laura Lee Junge and other contemporary artists. The Gallery is open every day of the week, free of charge. Hours are Monday thru Saturday: 11am – 8pm, Sunday: 12 Noon – 5pm. For more information, visit http://www.J2Gallery.com.